The worst time to find out your credit card isn’t working is when you’re in the middle of a transaction — particularly when you're at the checkout. Depending on the issue, you may be able to fix it right away, but you might have to use another payment method until you do. Worst-case scenario, you’ll have to save your purchase until you fix your credit card issue. Here are some reasons your credit card may not work. New credit cards are affixed with a sticker with instructions for activating it. Typically, you only have to call a 1-800 number and enter the last four digits of your social security number or the billing zip code. The call will only take a few moments and your credit card will be activated right away. Some credit card issuers let you activate your credit card online or via a smartphone app, but calling may be quicker. Your credit card may stop working after you reach the expiration month. In some cases, it may even cease working during that month. If you think your credit card has expired, check your mail. Your credit card issuer has probably sent a replacement credit card already. Otherwise, call your credit card issuer to find out whether a new card is on the way. Your credit card company may issue you a brand new card. For example, if your account number has been compromised after a major data breach, a new credit card may be on the way. The card company will likely also cancel the old one. Many credit card issuers are sending more secure credit cards with EMV chips. This technology prevents cards from being cloned or duplicated. Your card issuer may deactivate your credit card after the new one has been mailed to you. Once you receive your new credit card, make sure to call and activate it so you can use it. The magnetic stripe on some credit cards may stop working after the card has been too close to a magnet or even a cell phone. 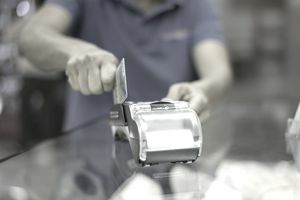 When the credit card has been demagnetized, you may experience a credit card read error or, in certain cases, nothing will happen after the swipe. Scratches or bends on the magnetic stripe may also prevent your credit card from being swiped. Your card number can still be manually entered, but you’ll have to get a new credit card to make swipe purchases. This happens with credit card transactions processed electronically. The information passes through a few different layers before the transaction is approved. Technical difficulties at any stage can cause issues with your payment processing. The merchant may be able to hold your credit card information and run the transaction once the technical issues have been resolved. Your credit card may be declined if you don’t have enough available credit for the transaction. You can't make a payment right away to free up some available credit — unless the card is linked to your checking account — so it’s best to use another payment method if you experience this problem. Your credit card may stop working if your credit card issuer suspects fraud on your account. This can happen in cases of legitimate fraud. For example, someone may be using your credit card to make purchases in another state. It can also happen when you make purchases out of the ordinary for your typical spending habits. Your credit card issuer may suspect fraud if you spend more than you usually do in a day. Most credit card companies require some notice that you're traveling and plan on using your card — especially when you travel abroad. Because of the number of fraud cases that happen overseas, many companies don't take the risk of letting charges incur in these cases. So if you know you're going to be away and plan on using your credit card, make sure you call your issuer to let them know where you'll be and the dates you'll be traveling. Even if you don't plan on using the card, it's a good idea to inform your credit card company, just in case an emergency arises and you're stuck. Online purchases require you to enter the billing information as it appears on your credit card statement. Your credit card won’t work if your billing information is incorrect — even if everything else is accurate. Verify all the credit card information you've entered matches your statement. If your credit card continues to give you problems, you may have to request a replacement. Many companies send a new credit card for free with the same account number, except in cases of fraud. Use a backup form of payment while you're waiting to receive the new credit card in the mail. There's nothing more embarrassing than seeing the word "decline" flash across the keypad when you try to use your credit card. There comes a time in many people's lives when this happens at the register. It can happen for a variety of reasons — some that have nothing to do with your own spending behavior, while others may be because of how you use the card. But being prepared with the right knowledge can help you overcome the challenges that come with a card that doesn't work.